William Makepeace Thackeray was born in Calcutta as the son of a Collector working for the East Indian Company. He was sent to England in 1816 after his father's death and he studied in Cambridge. During the trip he made a stop at St. Helena where Napoleon was pointed out to him. In England he lost much of his father's fortune through gambling and he left the university without taking a degree. He travelled to the continent and spent the winter in Weimar, where he met Goethe. Back in Germany he studied law for a while. After the bankruptcy of an Indian bank the rest of his inheritance was lost and he started to earn his living as a journalist. In 1834-1835 he lived in Paris, where he met his wife, Isabella Shawe. They married in 1836. After a few happy years his wife developed mental problems, possibly because she was lonely since her husband was often away for work. In 1840 she broke down and she never recovered. Thackeray sent their children to France to his mother (in 1846 they returned to him in England). He doted on his daughters and was always afraid he would die early and leave them not enough money to lead a comfortable life. In 1839 he had published his first novel "Catharine" but success came in 1848 with "Vanity Fair". The book made him famous and his poverty was over, allthough he had to work hard to pay for the care for his wife and his daughters. He had a longstanding affair with Jane Brookfield, the wife of a friend from Cambridge. She didn't leave her husband and eventually he ended the affair, allthough they were still occasionally in contact. Like Charles Dickens he lectured in the United States and in 1860 he became the first editor of Cornhill Magazine, a well paid job. In that position he effectively helped to launch the career of Anthony Trollope. His contacts with Charles Dickens had been cordial but during the last years of his life they didn't speak to each other after a serious quarrel. 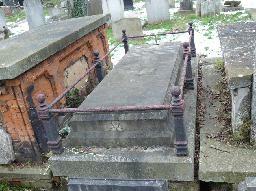 Just after he had reconciled with Dickens by handshake he suddenly died in December 1863. Dickens was at the funeral and his grief was far more intense than other people present had expected. 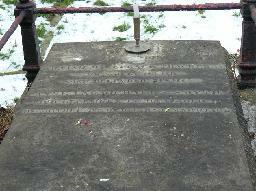 The grave of William Makepeace Thackeray at Kensal Green Cemetery, London.